STARKVILLE, Miss. – Sophomore right-hander Eric Walker fired seven shutout innings and right fielder Antoine Duplantis hit two solo home runs as the No. 12 LSU baseball team secured the series against No. 2 Mississippi State with an 11-2 win Saturday afternoon in Dudy Noble Field. With the win, LSU improves to 19-9 on the year and 6-3 in Southeastern Conference action while Mississippi State falls to 24-5 overall and 5-4 in the league. LSU has won 13 of its last 14 SEC regular season series against Mississippi State and 12 of the last 13 regular season series against the Bulldogs under head coach Paul Mainieri. The win secured the first SEC road series win for the Tigers since May 2017 when LSU swept Mississippi State to close out the regular season in Starkville. 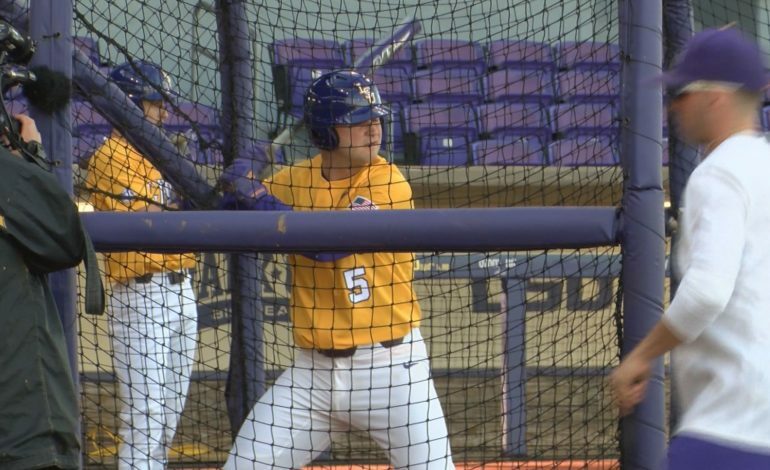 The Tigers will return to action Tuesday against Grambling at 6:30 p.m. CT in the annual “Throwback Night” game in Alex Box Stadium, Skip Bertman Field. The game will be available online only through the SEC Network+. Fans can listen to the game on the LSU Sports Radio Network, including 98.1 FM in Baton Rouge. Walker improved to 2-1 on the year after limiting Mississippi State to four hits. The sophomore walked two and struck out three. Todd Peterson fired the final two innings for the Tigers and gave up two runs on six hits and struck out one. Peyton Plumlee (1-1) suffered the loss after giving up one run on two hits, walked one and struck out four in two innings. Mississippi State used six pitchers for the final seven innings. They combined to give up 10 runs—seven earned—on nine hits, walked five and struck out eight. In the first at-bat of the game, Duplantis crushed a ball over the right field fence for his sixth home run of the season to put LSU ahead, 1-0. In the top of the fourth inning with one out and first baseman CJ Willis on first after taking a walk earlier in the inning, left fielder Giovanni DiGiacomo slapped a RBI double to left-center. With two outs, DiGiacomo advanced to third on a wild pitch and then scored to put the Tigers up 3-0. With the bases loaded and one out in the top of the fifth inning after second baseman Hal Hughes reached on an error, Duplantis slapped an infield single and center fielder Zach Watson was hit by a pitch. After a one hour and 19-minute rain delay, third baseman Chris Reid hit a ball deep to center field for a sacrifice fly, which allowed Hughes to tag up and increase the LSU lead to 4-0. The Tigers put up four runs in the top of the seventh inning to jump out to the 8-0 lead. Hughes opened the frame for the second consecutive inning by reaching on an error. The sophomore stole second and Duplantis walked before shortstop Josh Smith singled through the right side to load the bases. Watson then lined an RBI single to left field to bring in Hughes, and Reid drew a bases loaded walk, which plated Duplantis. LSU drove another run home when Willis placed a single into shallow right field to keep the bases loaded, and DiGicacomo followed by driving in his second run of the day with a sacrifice fly to center field to cap the LSU scoring in the inning. With two outs in the top of the eighth inning, Duplantis demolished his second home run of the day over the right field wall to extend the Tiger advantage to 9-0. In the top of the ninth inning, Reid led off with a double down the right field line and Willis drew a walk. With the runners in scoring position after a ground ball, designated hitter Cade Beloso hit a sacrifice fly to left field and brought in Reid. In the next at-bat catcher Brock Mathis ripped an RBI single to third base to put LSU up 11-0. Mississippi State third baseman Justin Foscue doubled to left-center to lead off the bottom of the ninth inning. With one out, left fielder Rowdey Jordan homered down the right field line to cut the score to 11-2.